The ruins at Khaj Rawlith mark the westernmost extent of the Anequine Conquests, when the Cat-Folk soldiers of the Golden Beast ruled the land from the Larsius River to the Strid. The vast echoing halls still evoke a certain brutal majesty. Fort Grimwatch is a fort in northwestern Reaper's March. The fort was constructed during the Second Empire upon the more ancient Anequinan ruins of Khaj Rawlith and surrounding two graht-oaks. Most of the Anequinan ruins lies underground, but the main entrance is open to the surface. 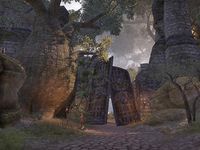 There are a number of ruined Imperial-style defensive towers located around the fort, constructed during the Second Empire occupation of Valenwood. It is possible to get into the lower interior levels of the southwestern and southeastern towers. Although nowadays the entire fort is in ruins, Aldmeri Dominion troops garrison the location. Of the two graht-oaks, only the southern one is currently occupied. Fort Grimwatch Objective: Drive the dark spirits from Fort Grimwatch. 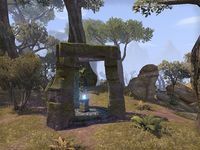 Fort Grimwatch Wayshrine is located a good distance northeast of the fort, south of Old Town Cavern.